Currently we have over 40 TIG welding stations, 5 spot welding sets, 8 MIG welding sets and a Fanuc ArcMate 500 amp Robotic Welding System, giving us a total of at least 12,000 hours of welding capacity per month. The welding of thin sheet metal is a specialist area. PEM employs some of the most highly skilled staff available anywhere and has invested in the latest TIG welding equipment. We weld metals from foils to 25 mm thick plates in mild steel, stainless steel and aluminium. We also weld more exotic materials such as titanium and have had impressive results on recent projects TIG welding brass. PEM Sheet Metal supplies to the Rail Industry and is a major supplier of welded components for level crossing barriers, points and cable tensioners. Welding of sheet metal, especially aluminium welding and stainless steel welding, requires high levels of skill and dexterity to produce clean, neat and visually appealing welds. It is also vitally important to minimise the heat input to stop distortions. 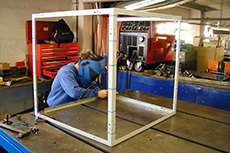 PEM Sheet metal has the staff and equipment to enable us to do this and to have an enviable reputation in this field. The welding of stainless steel and aluminium are areas of particular skill. Many of our products are for customers in the medical industry. They often require stainless steel to be welded to tight tolerances and to an extremely high visual standard with no ‘inclusions’ or porosity. Usually there will be no finish applied or perhaps just electro polishing. In ether case the quality of the weld is paramount. Also for food and pharmaceutical applications we have the ability to 100% gas purge to minimise oxidisation around the heat affected zone. The welding of tube and pipe work for the food and beverage industry is now becoming a growing part of out business.